Thallus: crustose, continuous or rimose-areolate; prothallus: not visible, or white areoles: flat, thin or thick, opaque, ecorticate surface: whitish gray to gray or pale green to greenish white, smooth, epruinose, with an indistinct margin, esorediate Apothecia: sessile, 0.5-1.3 mm in diam., lecanorine disc: orange-brown or pale pink to carneous, plane or convex, heavily whitish gray pruinose margin: concolorous with thallus, thin or thick, persistent, prominent, not flexuose, smooth, entire, without a parathecial ring amphithecium: present, with numerous algal cells, with numerous small crystals which dissolve in K, 35-80 µm thick, corticate; cortex: hyaline or pale yellow, indistinct or distinct, basally not thickened, interspersed, (30-)55-75(-80) µm thick laterally, (30-)55-75(-80) µm thick basally parathecium: hyaline, containing crystals insoluble in K epihymenium: brown to dark brown, with pigment dissolving in K, with crystals dissolving in K hymenium: clear; paraphyses: slightly thickened (up to 2.5 µm wide) apically, not pigmented; subhymenium: hyaline, 15-20 µm thick; hypothecium: hyaline, without oil droplets asci: clavate, 8-spored ascospores: hyaline, simple, ellipsoid or broadly ellipsoid, (9-)12-14(-14.5) x (5.5-)6-7.5(-8.5) µm; wall: less than 1 µm thick Pycnidia: not seen Spot tests: K+ yellow, C+ orange to orange-red, P- or P+ pale yellow Secondary metabolites: atranorin (major), chloroatranorin (minor), eugenitol (minor), and sordidone (major). Substrate and ecology: on bark or wood of deciduous trees and conifers World distribution: temperate areas of Africa, Asia, New Zealand, Europe, and North America Sonoran distribution: Arizona, southern California, and Chihuahua. 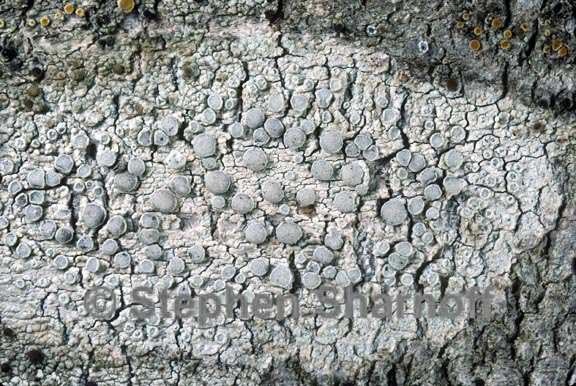 Notes: Lecanora carpinea is easily recognized by its heavily pruinose apothecial disc, a well developed amphithecial cortex and the presence of sordidone in the apothecial pruina. Very similar is the Eurasian L. leptyrodes that can be distinguished by the absence of a cortex. Some morphs of L. caesiorubella may be similar and some chemotypes also contain sordidone. However, this species is readily distinguished by the absence of an amphithecial cortex and the presence of depsidones.